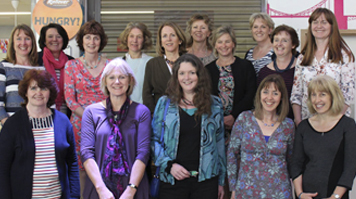 Home » About Us » News » LSBU Nursing class of 1985: Where are they now? LSBU Nursing class of 1985: Where are they now? A group of 24 nursing graduates from the class of 1985 returned to London South Bank University (LSBU) to celebrate 30 years since they graduated. In 2015, these nursing graduates are now senior leaders in clinical research and practice development, some taking their skills across the world to Australia and Canada. Current and prospective LSBU nursing students were given the chance to hear how the university shaped the remarkable careers of several of the alumnae. Professor Anne Williams, Chair of Health Research at Murdoch University in Australia, explained: "Studying at LSBU has formed the basis of all my jobs thus far, so it's great to have the chance to share my experience with students who are embarking on a career in nursing and also let them know about some of the challenges they may face along the way." LSBU alumna Professor Anne Williams and Jo Palmer spoke to students about their clinical nursing research career before offering advice to students about securing their dream job in nursing. "Attending the reunion allowed us to see the wonderful things which the class of '85 have been doing since graduating from LSBU 30 years ago. It's interesting to see the various career paths which the graduates have taken and getting the chance to reminisce about the good old days at LSBU was truly memorable," added Jo Palmer, Senior Sister at University Hospital Southampton NHS Foundation Trust.